Some people told drummer Barbara Borden that her drumming was “pretty good for a girl.” But Borden says that she was fortunate to have a family who gave her a lot more encouragement than that. Photo courtesy of Barbara Borden. All of the drummers that Barbara Borden saw as a child were men—except for one little boy, a Mouseketeer named Cubby. Even so, at age 5 while shopping one day with her mother at Sears Roebuck, Borden spied a drum and insisted on having it. 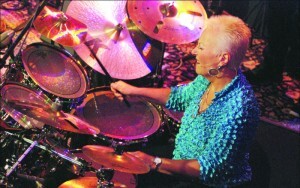 At age 70, Borden—drummer, drum teacher and performing artist—knows for certain that “drumming is my path.” The large drum set that occupies a prominent place in the living room of the woodsy Mill Valley home that she shares with her life partner, Naomi Newman, is a monument to her life’s work. Borden, who grew up in Los Angeles, started on her path when she played the drum kit in her elementary school orchestra. After majoring in percussion at San Francisco College (now University), she studied classical percussion with Roland Kohloff, and years later, she would study with renowned Marin County teacher Chuck Brown. After moving to San Francisco at age 19, Borden was drawn to the city’s many jazz clubs and its beatnik culture, and later became a part of the burgeoning women’s movement. Eventually hooking up with Alive!, a sizzling women’s jazz group that became her musical family, she played everywhere, including at the Keystone Korner in San Francisco and at many other clubs and festivals. “I thought that band would go on forever,” Borden says of the eight “passionate” years that they played together. “It took me 15 years to get over that ending.” Her father had walked out on the family when she was 8; she hadn’t ever expected to revisit the same kind of sorrow. Borden’s story is now beautifully and energetically captured in Keeper of the Beat: A Woman’s Journey into the Heart of Drumming. Written and directed by three-time Emmy Award-winning filmmaker David L. Brown, the film was born after a seven-year collaboration. Borden is grateful for Brown’s artistry, as well as his tenacity. “David always goes for the heart in his films and never gives up,” she says. Keeper of the Beat weaves together original, as well as vintage, footage and stills, and portrays the life of a gifted woman—a pioneer in her field. It has been acclaimed at film festivals, including the Mill Valley Film Festival, and in other venues including PBS television. Seeing her perform in the film Keeper of the Beat, one encounters a gracious, intelligent woman with a very large personality and an incandescent smile. Dressed in flowing jewel-toned outfits accented with chic jewelry, Borden’s impressive ability to focus and lose herself in the moment makes you want to pick up a drum, or at the very least break out into a wild dance. Borden experiences an “ecstasy” when she performs and feels that “this is the experience I was brought here to have and share with others.” At these times, she says, “I break out of myself, having no thoughts about anyone, or anything, and at the same time I feel totally connected to the music, other musicians and the audience.” Drums are communication, and for her a transmission of joy and love. Barbara has taken communication and connectedness to rare heights. Although she has been called a one-woman percussion orchestra, “it has been a revelation that the most important thing to me is not fame, fortune or being the best drummer.” This profound feeling has led her to form powerful connections with cultures around the world through drumming. She has formed profound relationships with people in Siberia and Africa and the Suquamish Tribe of Washington state as well as locally teaching privately and with groups of the elderly at The Redwoods. Part shaman, part pied piper, Borden brings a type of healing and aliveness to us all with her joyful and passionate drumming, her generous gifting of personal and well-loved drums to other cultures and her genuine acceptance of others. “Barbara’s message of hope, love, positivity, joy, gratitude and keeping the beat of all these positive values, is inspiring and uplifting,” Brown writes.